sweeper from CMS sweeps metal objects off of the floor quickly covering a large area in a short period of time. 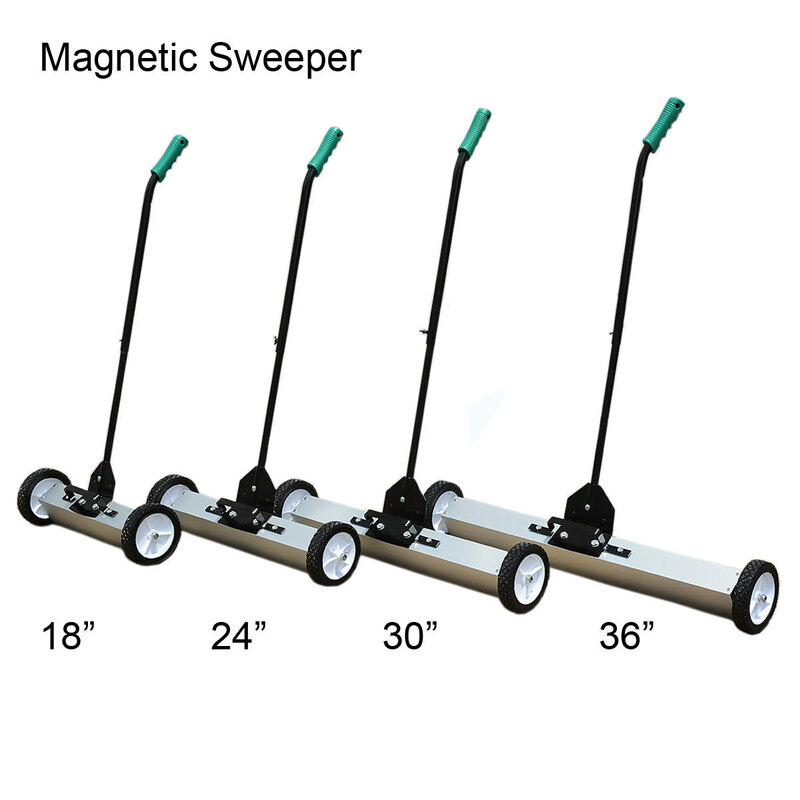 These magnetic floor sweepers are an industrial business asset for roofers or other contractors to, pick up nails from the work site or a business owners parking lot for the protection of your clients cars. By rolling this magnet sweeper around the parking lot you can keep that customer happy. Magnetic sweepers, are a must have tool for all warehouses, roofers, machine shops, gas stations, small business owners parking lots...anywhere metal objects are a nuisance. Most of our magnetic sweepers with wheels are for smaller areas and are hand pushed. Some of our magnetic sweepers can be mounted on forklifts and other vehicles for larger scale CMS Magnetics & Magnets For Sale has a large variety of sizes & configurations of magnetic sweepers available for immediate shipment. Our 18” wide Magnetic Sweeper is made with permanent ceramic magnets to pick up nails and scrap metal. Perhaps you are a business owner and do not want clients to come back to their car on your parking lot to a flat tire pull out the Magnetic Sweeper. Have a need for a larger 30 inch wide magnetic sweeper or perhaps our 36" wide magnetic sweepers? Maybe you need to protect your vehicle’s tires and the guys have been breaking up pallets in the back. This magnetic sweeper will take care of that too. Your magnet sweeper’s magnets are enclosed in a heavy duty outer casing for their protection.